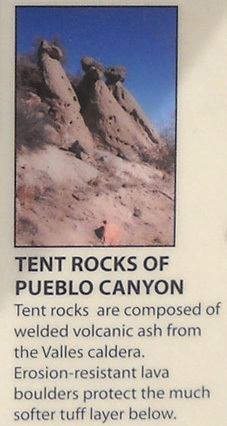 of Pueblo Canyon. 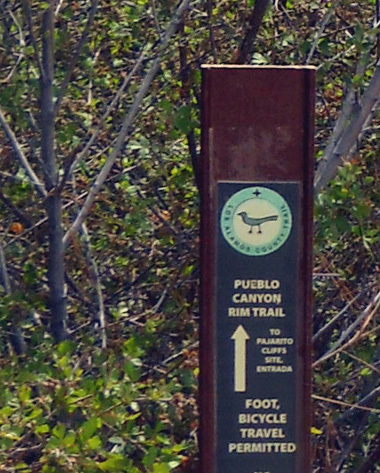 The trail connects East Park with the Pueblo Canyon Rim Trail. 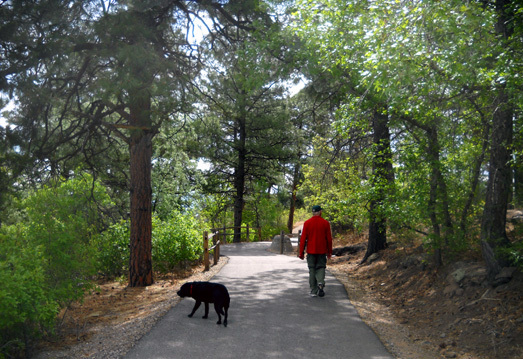 offers an easy stroll and is accessible to wheelchairs and child strollers." 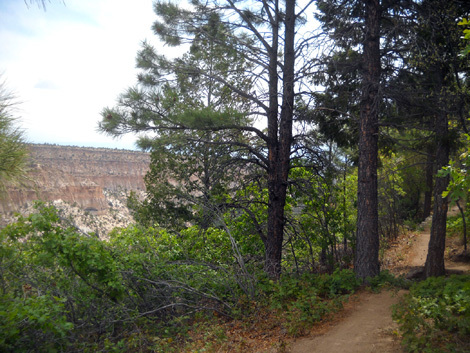 The Los Alamos Mesa Trail and Pueblo Canyon Rim trails are built into the hillside a few feet below the top of the mesa on the south side of Pueblo Canyon. 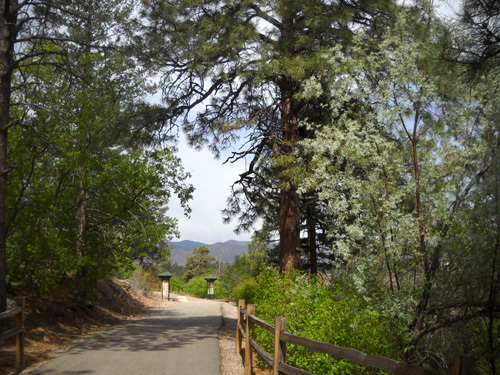 The paved Los Alamos Mesa Trail starts at East Park and runs east for 4/10ths of a mile before morphing into winding, sandy, single-track Pueblo Canyon Rim Trail. 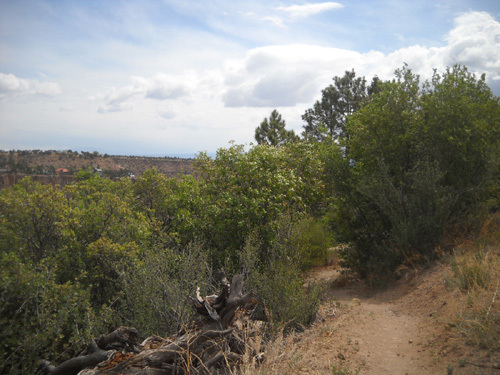 That trail stretches another 3+ miles before intersecting with the Camp Hamilton Trail at the eastern end of Los Alamos Mesa. 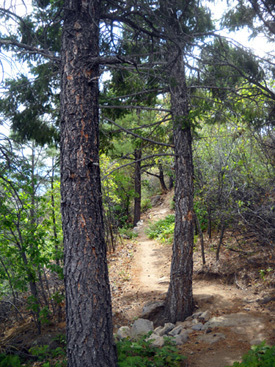 These trails are part of the extensive Los Alamos County hike-and-bike trail network. 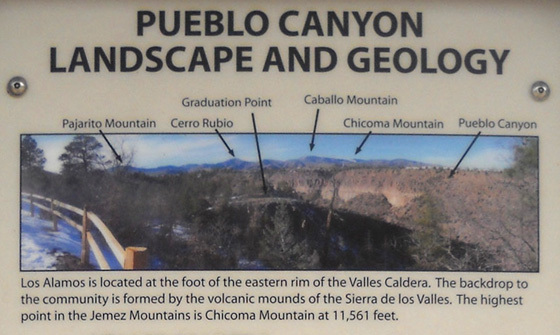 They connect with the Canyon Rim Trail above DP Mesa that I wrote about previously, as well as trails in Graduation and Pueblo Canyons. 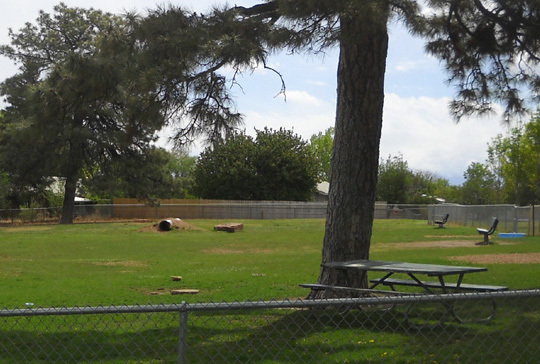 I took that photo from the back of our campsite at Eastgate-Sunrise Park. 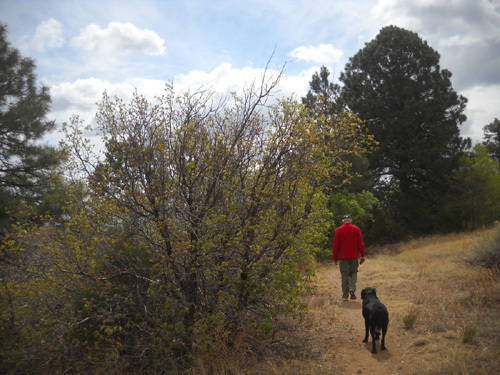 Compare the sky with the photos below from our hike a little while later. 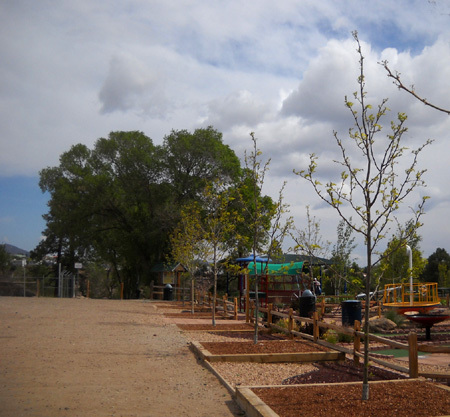 Each storm was followed, for a little while at least, by blue skies and fluffy white clouds. 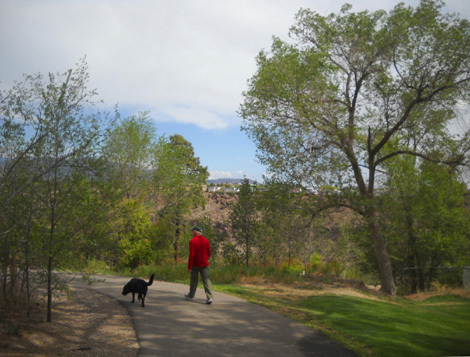 The trailhead for the Los Alamos Mesa Trail is toward the rim of Pueblo Canyon, just beyond the dog park. 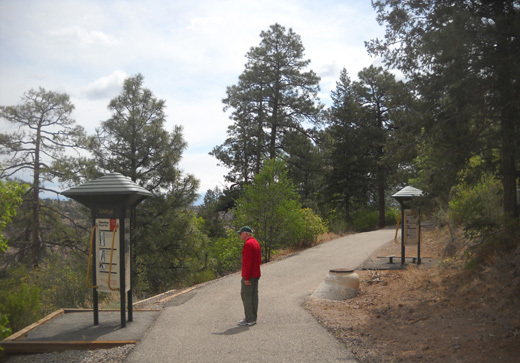 The paved Los Alamos Mesa Trail is an easy trail with only 10 feet of elevation gain and loss; as mentioned in the quote above, it is ADA compliant so even folks in wheelchairs can enjoy views of the canyon and mountains from the trail. 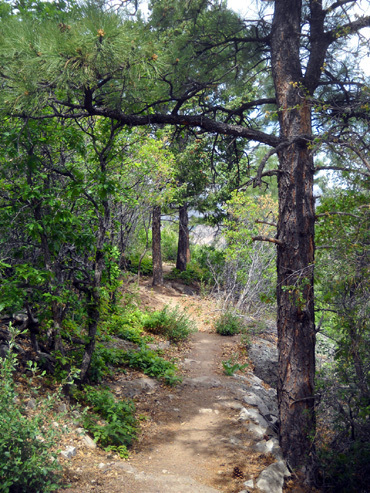 Nice trail, eh? 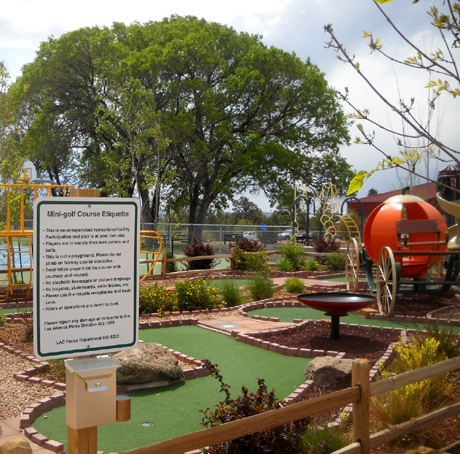 People of all ages and abilities can enjoy that one. 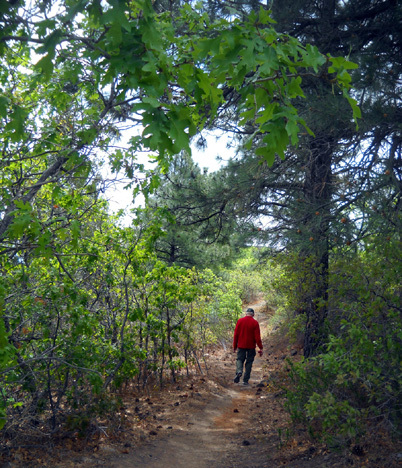 The first part of the trail is rather flat, soft, and sandy. 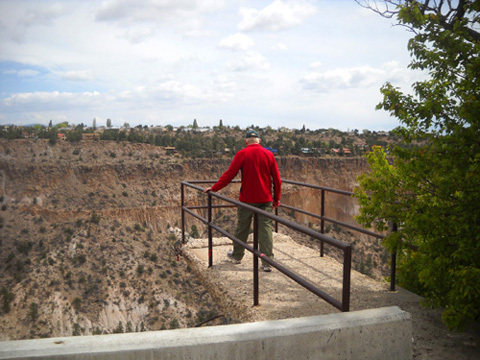 We were surprised to come to this cantilevered overlook. I let Jim test its durability while I took a couple pictures! I reluctantly turned around after approximately half a mile. 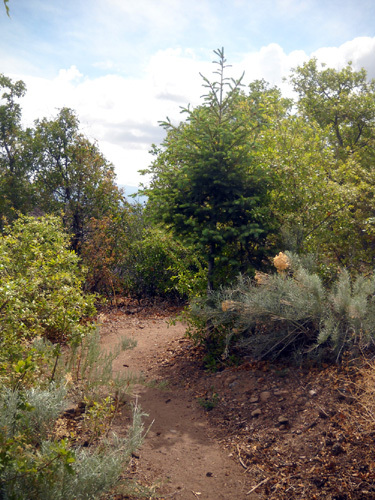 Except for a short, unattractive section next to the high chain link airport fence, this is a very interesting trail with scenic views. I didn't want to keep Jim waiting too long while I satisfied my curiosity, however. 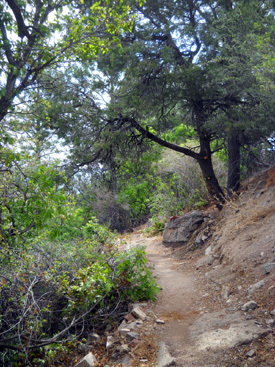 That trail's on my list for "next time." 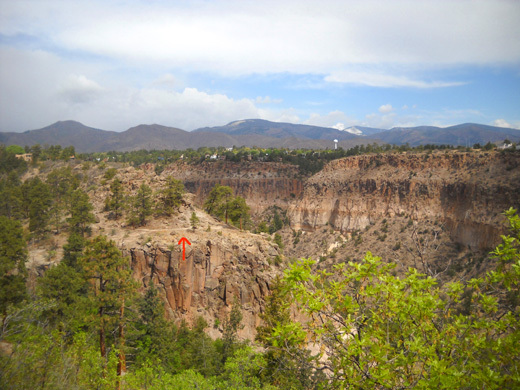 I want to hike it at least as far as the Pajarito Cliffs site. 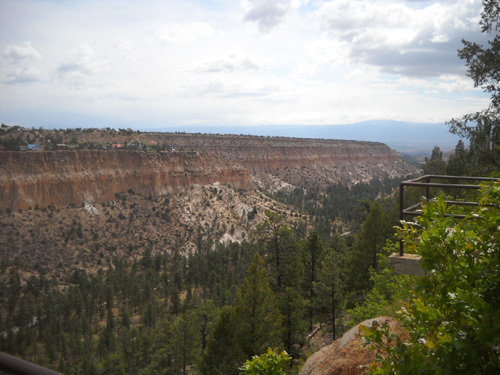 East Park, and the Canyon Rim Trail to our truck. 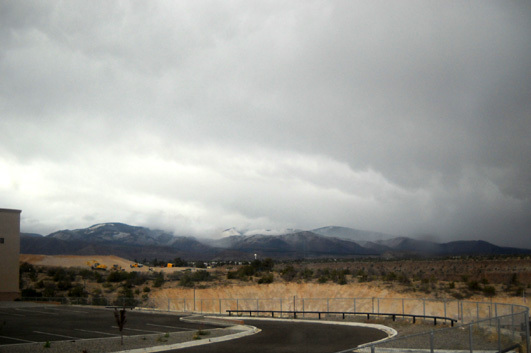 Then we drove onto Los Alamos National Lab property and treated ourselves to some spicy chicken enchiladas for lunch at Hot Rocks Java Caf�. 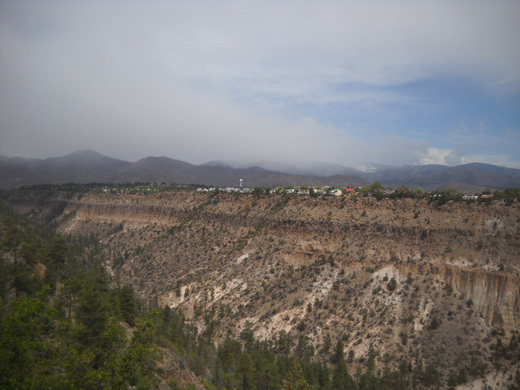 That's the restaurant that supplied the tasty Mexican dishes after the Jemez race. 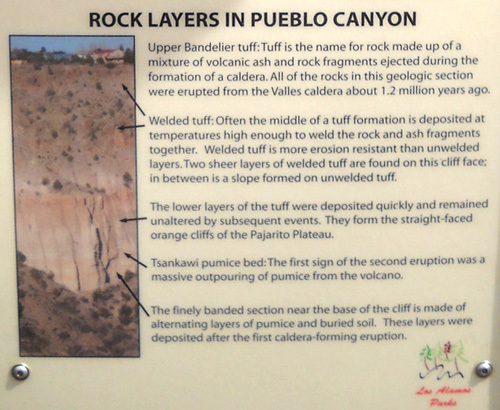 I think we were the only folks in the restaurant without LANL badges on. For dessert we drove back downtown to Ruby K's and shared a cherry turnover and raspberry smoothie to literally cool our palates after that spicy Mexican fare. The smoothie was more like "icy," and we both got instant brain freeze! 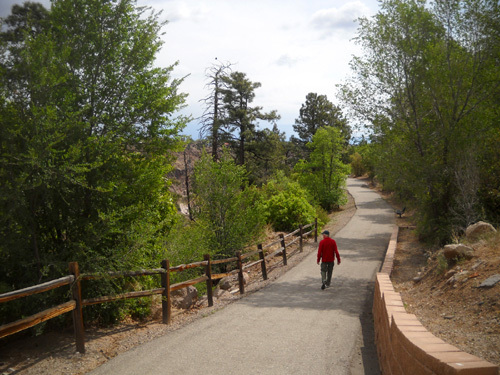 While Jim visited the Los Alamos Historical Museum and Bradbury Museum (I've written about them previously), Cody and I walked around Ashley Pond, Bathtub Row, the Fuller Lodge, and the old Indian pueblo ruins downtown. I also went into the Art Center (without Cody-pup). 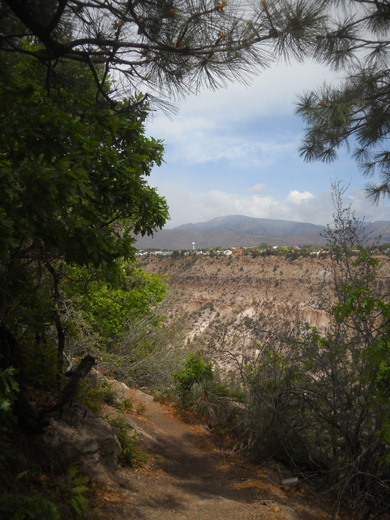 I'll show photos from that excursion in the next entry. 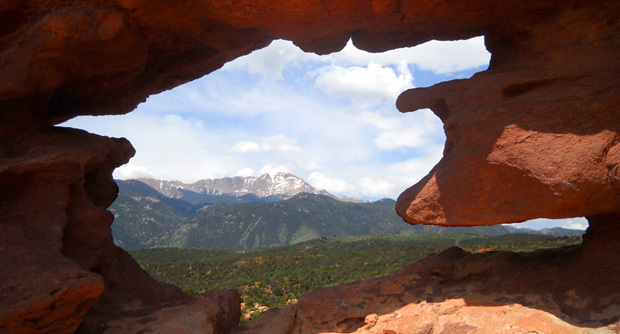 I'll also address this week's weather mayhem here and across the country in another entry.